Intersubnet Roaming – This figure shows intersubnet roaming, which occurs when the wireless LAN interfaces of the controllers are on different IP subnets. on the client roam. However, instead of moving the client database entry to the new controller, the original controller marks the client with an “Anchor” entry in its own client database. The database entry is copied to the new controller client database and marked with a “Foreign” entry in the new controller. The roam remains transparent to the wireless client, and the client maintains its original IP address. network connectivity issues after the handoff. Mobility is not supported for SSIDs with security type configured for Webauth on MAC filter failure. mobility feature is not supported. When the primary and secondary WLCs fail to ping each other’s IPv6 addresses, and they are in the same VLAN, you need to disable snooping to get the WLCs to ping each other successfully. it falls back to L3 authentication and then tries to roam to a different Cisco WLC, the roaming will fail. The same behavior is applicable to FlexConnect central switching and local mode as well. 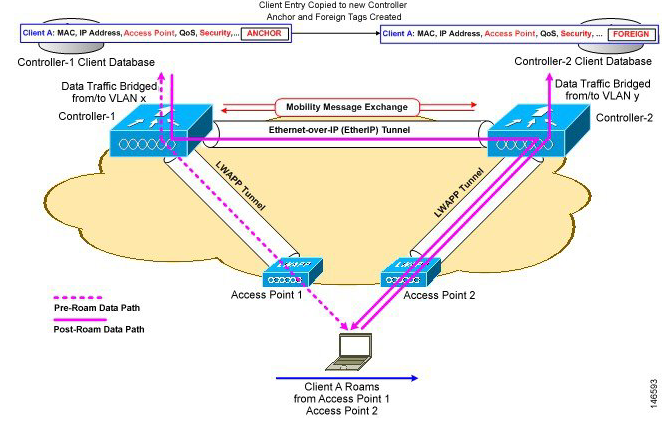 client mobility move count on intra-VLAN.